The high street brands have been sitting up and taking notes from the high-end catwalks and have really gone to town for the upcoming season, our favourite picks so far have come from top-dogs H&M and Topshop. 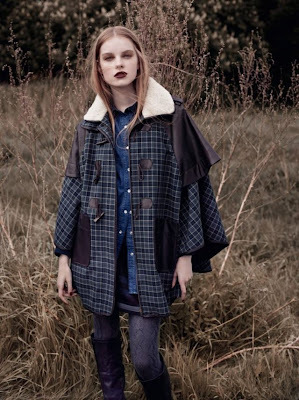 Taking inspiration from Britain’s ‘outdoorsy’ heritage we see a lot of heavy materials like tweed and leather being turned into fantastically contemporary pieces. Sheepskin and shearing is going to be HUGE this season, and Topshop have incorporated this brilliantly in the form of an oversized sheepskin cape, (sure to be a bestseller). Leather, faux fur and tailoring are also big themes, with every look accessorised with hunting hats and dark-berry stained lips. Tough embellishment on-top of floaty tea dresses gives us that Topshop edge we crave, while sophisticated blouses and fedora hats brings in some grown-up glamour. A certain masculinity theme has taken over the H&M collection, with tailored suits, bowler hats and high-waisted wide-legged trousers stealing the show. A playful use of volume is also a major story, with oversized coats and capes being paired up with skinny grey leggings. Paisley print takes over billowing jumpsuits and scarf’s while corduroy shorts ride high on the waist. Leather teamed with sheer black pieces incorporate the glam-goth theme nicely and all with H&M’s usual inspirational quirkiness. Excitement is certainly in the air for fashion lovers everywhere as we all embrace our slightly darker selves for a winter full of animalistic desires…. (we can feel it kicking in already with all these beautiful looks!). We never thought we’d say this but…roll on Autumn!